If you follow the Lego games, then you already have at least a rough idea of what the recently announced Lego Marvel Super Heroes we saw in action at GDC is all about. Strip away the Marvel trappings, and you take control of a character on a mission that will generally involve putting pieces of things together to solve puzzles, and smashing other things down to progress (and for fun). Collecting little studs strewn about to bolster your score is also a big emphasis once again, and two-player co-op returns as well. That is the familiar groundwork of the Lego games, and it isn’t likely to change anytime soon. TT Games has yet to embrace even the tropes that would seem like an obvious fit for a game like this, including online co-op play. It was only very recently that the games embraced actual voice acting. And yet there is a reason the franchise continues to work so well. The gameplay is simplistic, yet oddly relax, and it can be embraced by players of all ages. There aren’t too many franchises out there that a parent can play with their kid and that adults of any age can also enjoy, but the Lego games are one of them. And then there is the writing. The Lego games are consistently among the funniest games around, and that shows no signs of stopping. If and when it does, when the writing talent dries up and grows stale, the series will be in deep trouble – but that day is hopefully still a long way off. The Lego games have also found a way to introduce a great deal of variety by not making it too complex. Lego Batman 2: DC Super Heroes features dozens of DC characters that you can play as, and while a few do repeat powers, most have their own unique controls. The gameplay differences aren’t night and day (which makes it technologically easy to run), but they do offer plenty of variety to keep things fresh. All of that, the good and the bad, remains true with Lego Marvel Super Heroes. The gameplay is familiar to the point of repetition, but the humor, variety in gameplay, and simple but addictive combat mechanics return once again. The game is set in the Marvel universe and stars many of the Marvel heroes you know as playable characters, while others will appear in supporting roles. But just because Hulk and Iron Man are prominently featured in the early levels doesn’t mean the games stars just the Avengers, far from it. The story begins with Silver Surfer crashing to Earth after a falling out with Galactus. His famed surf board shatters and the pieces scatter around the world, becoming “Cosmic Bricks” that both heroes and villains alike are trying to recover. The story will take you through several familiar Marvel locales, and the action will continually shift between several characters. TT Games isn’t ready to list off all the playable characters yet, but Thor, Captain America, Iron-Man, Spider-Man, Hulk, Wolverine, and many others will be playable during the story, while the freeplay mode will unlock over 100 playable characters, both hero and villain, just as Batman 2 did. Each of the playable characters in the story will have their own powers, and this will often lead to puzzle solving. The humor is what will really sell this game though, as is generally the case with most of the Lego titles. Hulk will smash! And then quietly reflect on the destructive nature of humanity. Iron Man will fly into a building, and then be grateful – and somewhat surprised – that he doesn’t own it. The game will also be flush with Marvel characters – and not just the heroes and villains. In one scene that was on display at GDC, the beleaguered members of Damage Control, the group often featured as the poor SOBs responsible for fixing the damage caused by super hero battles, looked on and cheered as the Hulk found his more civil side and began to sweep up after a battle. 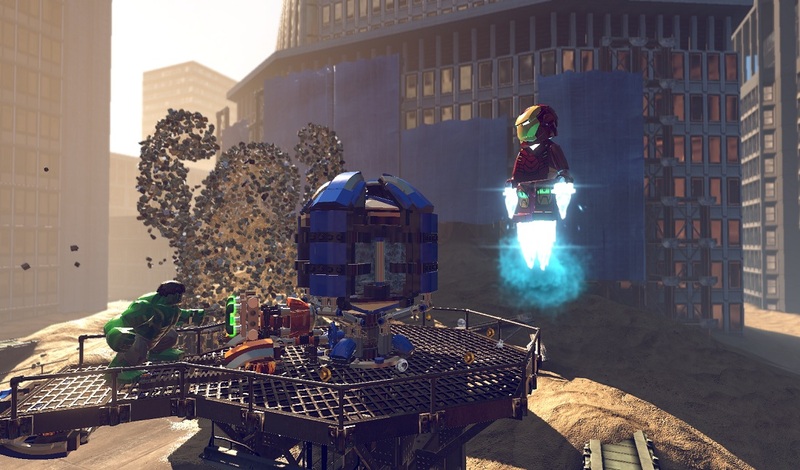 Lego Marvel Super Heroes is due out later this year for PC, PS3, Xbox 360, and Wii U, with what are likely to be modified version available for Nintendo DS, 3DS, and PS Vita.